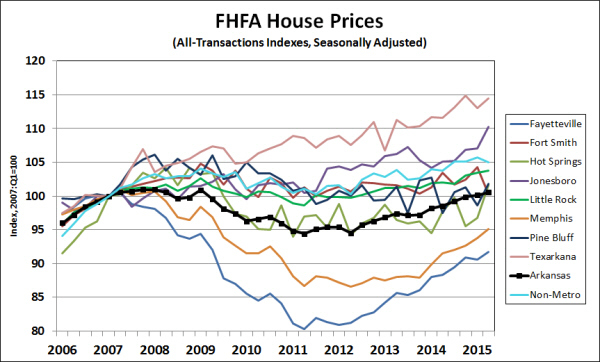 The Federal Housing Finance Agency (FHFA) has published new statistics on house prices across the nation. The data for Arkansas continue to show an upward trend in prices, but with slower rate of appreciation than the nationwide average. The most comprehensive of the FHFA indexes, Expanded Data Indexes†, show that house prices in Arkansas rose 1.2% in the second quarter of 2017, compared to an increase of 1.7% for the U.S. Year-over-year growth rates were 4.2% for Arkansas and 6.7% for the U.S.
Increases in Arkansas house prices have been consistently lower than the nationwide average throughout the post 2011 housing recovery. In part, this is simply a function of having experienced a less severe downturn during the 2007-11 housing price collapse. Compared to the beginning of 2007, the net increase in housing prices in Arkansas has been 3.9% while the comparable figure for the U.S. average is 2.8%. The Expanded Data indexes are not calculated for metropolitan areas, but the FHFA does publish figures for its All-Transactions Indexes†. By this measure, house prices increased in the second quarter throughout much of the state, with quarterly declines registered for Fort Smith and Pine Bluff. Prices in Jonesboro were essentially unchanged. Over the past year, prices have risen in all metro areas except Pine Bluff, which has seen a decline of 7.9%. Source: Federal Housing Finance Agency. Seasonal adjustment by the Arkansas Economic Development Institute. Over a longer span of time, it is clear that Fayetteville and Memphis are seeing the most rapid rates of appreciation. As illustrated in the figure below, these were also the metro areas that suffered the largest price declines during the period of falling prices. Meanwhile, house prices in Texarkana and Jonesboro have not increased as rapidly in recent years, but were largely unaffected by the housing price collapse. Compared to 10 years ago, the metro area with the greatest house-price appreciation has been Texarkana, with Jonesboro also registering above-average increases. 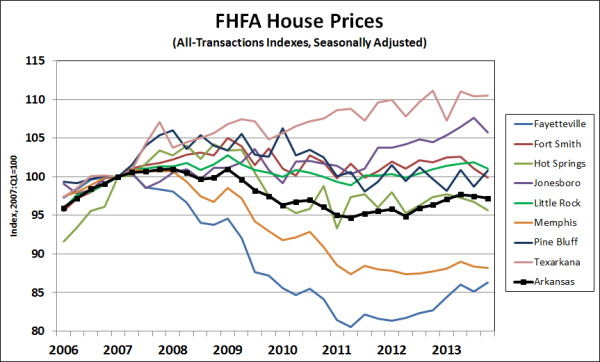 †The FHFA produces several house price indexes with different coverage. The basic Purchase-Only Index includes prices from home sales that were financed through the federal enterprises Fannie Mae and Freddie Mac. The All-Transactions Index also incorporates appraisals associated with refinancing. Finally, the Expanded Index incorporates information from county recorders’ offices, capturing home sales that were not financed through the government housing enterprises. The comparatively rapid pace of house prices nationwide reflects a rebound effects in the areas where prices declined the most during the market crash of 2007-11. As shown in the following figure, that pattern holds true for the metro areas that cover parts of Arkansas. House prices declined by over 12% in Memphis and by nearly 20% in Fayetteville from 2007 to 2011. Those two metro areas have also seen the most rapid home-price appreciation since 2012. Having experienced little depreciation during the period of housing price declines, Jonesboro and Texarkana have seen the highest rates of cumulative price increase since 2007. In the most recent quarter, house prices were up in all of Arkansas’ metro areas except Little Rock, where prices are reported to have fallen by 1.0%. Prices were down over the quarter in non-metropolitan regions of he state. Over the past year, prices have risen most rapidly in Fort Smith and Fayetteville, and have risen most slowly in Pine Bluff and Little Rock. 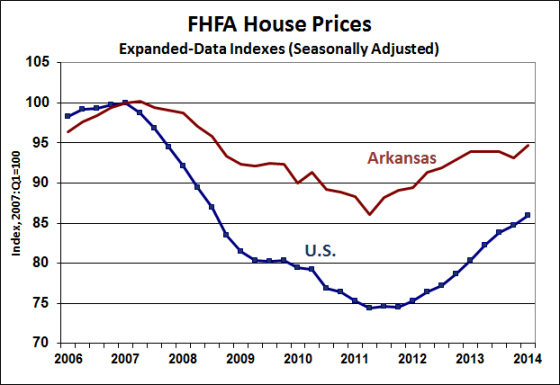 New data from the Federal Housing Finance Agency (FHFA) show continuing appreciation of Arkansas house prices. 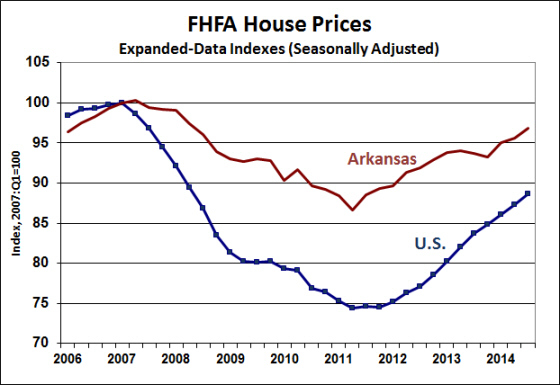 As illustrated in the figure below, the FHFA Expanded-Data Index for Arkansas increased in each quarter of 2015. In the fourth quarter, the index was up 1.1% from the previous quarter, and 3.2% higher than the previous year. The index for the U.S. — recovering from a significantly sharper decline of 2007-2011 — was up 1.3% for the quarter and 5.6% for the year. The expanded data indexes are only available at the state level, but the FHFA publishes All-Transactions indexes that cover metropolitan areas as well. 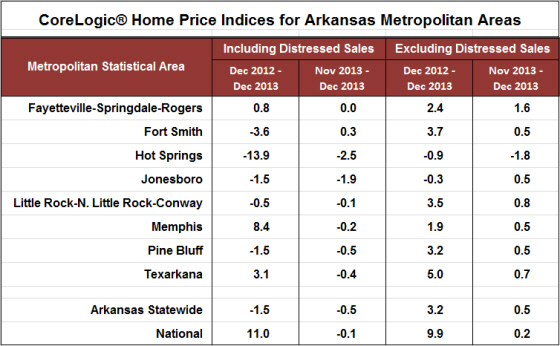 The table below summarizes recent house-price changes in Arkansas’ eight metro areas. In the fourth quarter, prices were down in Little Rock, Pine Bluff and Texarkana. For the year, prices were down only slightly in Texarkana, but were higher in all other metro areas (as well as the non-metropolitan portions of the state). Source: Federal Housing Finance Agency; Seasonal Adjustment by the Institute for Economic Advancement. House prices in Northwest Arkansas have shown the most rapid appreciation over the past five years, but are recovering from the largest house-price declines in state during the 2007-2011 period. In fact, the figure below illustrates that most of the state’s metro and non-metro areas suffered only modest declines during the nationwide housing price collapse, and all have shown at least modest appreciation over the most recent two- to five-year period. Recently-released data from the Federal Housing Finance Agency (FHFA) show that Arkansas house prices continued an upward trend during the second quarter of 2015. 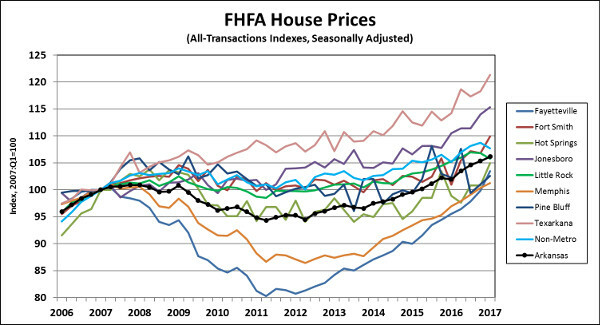 Statewide, the FHFA “expanded data” index increased by 1.0% from the first quarter, and was up 2.9% from a year earlier (seasonally adjusted). By comparison, the national index was up 1.5% quarter-to-quarter, and up 6.2% year-over-year. Around the state, metro-area house prices (as measured by all-transactions indexes) were generally up — with the notable exception of Fort Smith. Volatility in the Fort Smith index masks a longer-term stability, with prices basically flat compared to five years ago. Among other metro areas, year-over-year increases ranged from 1.7% in Little Rock to 4.9% in Jonesboro. Over the past five years, the metro areas with the most rapid rates of appreciation were Fayetteville and Jonesboro, both up 8.5%. Since reaching a low point in 2011:Q2, house prices in Fayetteville have increased by 14.3%, recovering over half of the losses experienced from the beginning of 2007 through 2011:Q2. As shown in the chart below, house price changes have varied considerably around the state since the housing market boom peaked around the beginning of 2007. Prices remain 5% to 10% lower in Fayetteville and Memphis, but are up 10% to 15% in Jonesboro and Texarkana. 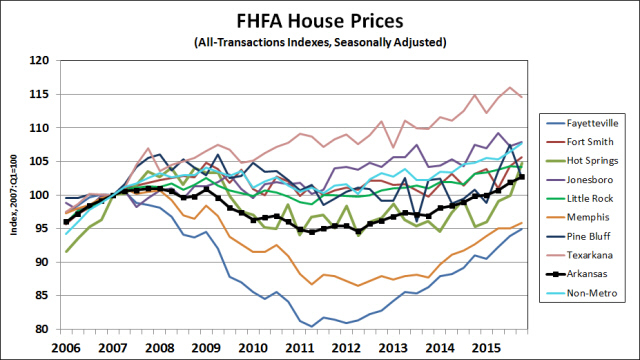 As measured by the all-transactions index, the statewide average of house prices is up slightly from 2007 (+0.5%). The Federal Housing Finance Agency released new data on home prices this morning. 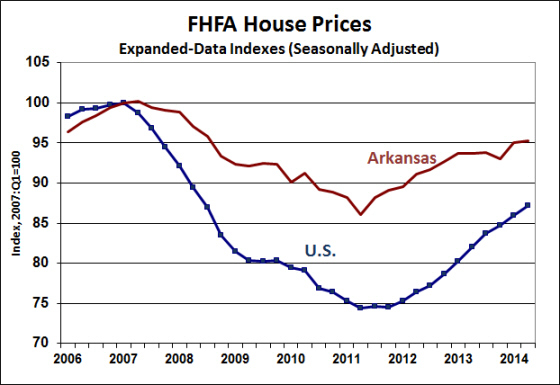 According to the FHFA’s “Expanded Data Indexes,” house prices in Arkansas declined slightly in the first quarter of 2015, falling by 0.4% from the fourth quarter of 2014. Compared to a year ago, house prices in Arkansas were up 1.7%. Nationwide, house prices were up 1.4% for the quarter, and were 5.8% higher than a year before. 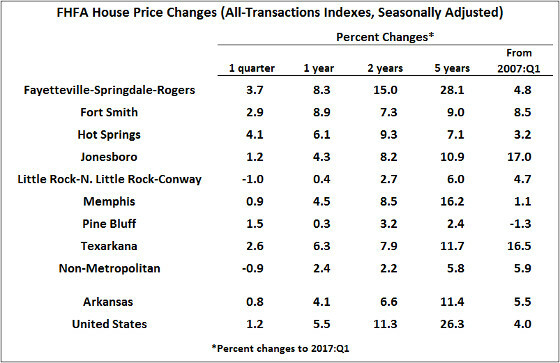 Since hitting a trough in the second quarter of 2011, prices have increased by 11.5% in Arkansas and 22.2% nationwide. The slower rate of appreciation in Arkansas reflects the fact that house prices declined be less then the rest of the nation during the price collapse of 2007-2011. The Expanded data indexes are compiled using data from actual sales prices gathered from FannieMae, FreddieMac, FHA and County Property Recorder sources. For metropolitan areas, FHFA publishes a set of “All-Transactions Indexes” that are based on actual sales prices along with appraisal values from refinancing. As shown in the chart and table below, home prices in the various metro areas of Arkansas have displayed widely differing patterns. Fayetteville and Memphis experienced price declines from 2007 to 2011 that were consistent with nationwide averages, but prices in both of those metro areas have shown significant recovery since then. At the other extreme, prices in Texarkana, Jonesboro, Fort Smith and Little Rock showed little downward movement during the nationwide decline, and have experienced net positive appreciation since 2007. Source: Federal Housing Finance Agency. Seasonal adjustment by the Institute for Economic Advancement. In the first quarter of 2015, home prices were higher in 5 of 8 metro areas, with declines in Fayetteville, Pine Bluff, and Texarkana. Pine Bluff was the only metro area to have experienced a decline compared to the first quarter of 2014. Over the 5 years since 2010:Q1, house prices have fallen 6.4% in Pine Bluff and 0.7% in Hot Springs, but are up in the state’s other metro areas. The highest rate of appreciation has been in Jonesboro, where prices are 8.2% higher than they were five 5 years go. 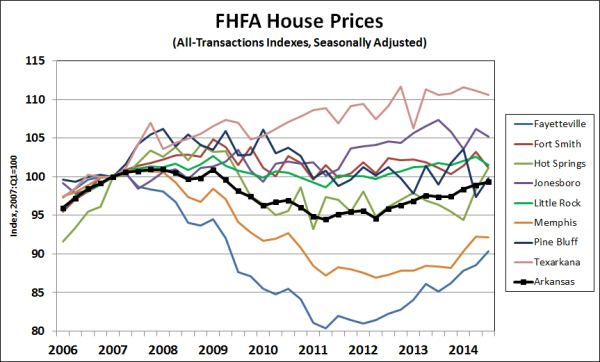 The latest house price data from the Federal Housing Finance Agency (FHFA) showed continuing appreciation at the end of 2014. According to the FHFA Expanded-Data Indexes, Arkansas house prices rose 0.6% in the fourth quarter (seasonally adjusted), and were up 3.0% for the year. This compares to a quarterly increase of 1.3% nationwide, and a 6.0% annually. 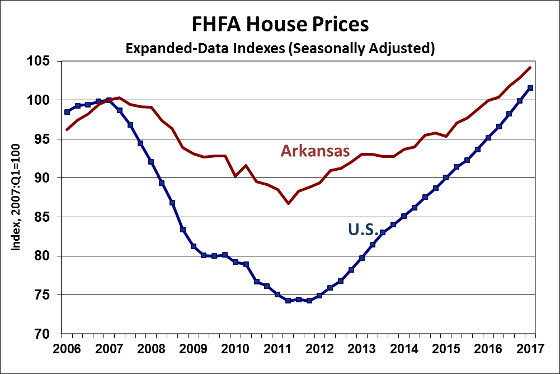 As shown in the accompanying chart, the slower pace of house price appreciation in Arkansas is largely attributable to the fact that the drop in house prices from 2007-2011 was not as pronounced in Arkansas as in many parts of the country, so the rebound is not as rapid. The fourth quarter figure for Arkansas shows house prices approximately 3.3% below their levels in the second quarter of 2007. This is roughly consistent with the latest data from an alternative source of home-price data, CoreLogic®, which shows house prices being 3.8% below their previous cyclical peak in mid 2007. Patterns of house price changes differ dramatically around the state. 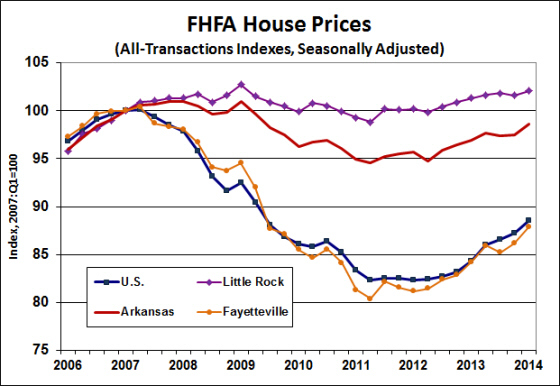 The chart below shows house price indexes for Arkansas metro areas, relative to the first quarter of 2007. Only Fayetteville and Memphis showed house price declines from 2007-2011 that were comparable to the national average. Other metro areas in the state experienced much more muted declines (or no decline at all). Hence, several metro areas in the state have experienced net appreciation over that past 7 years. 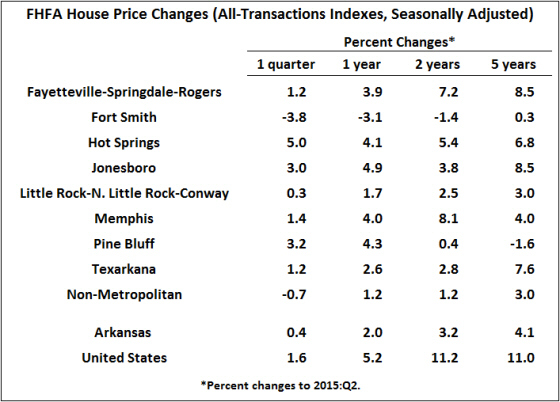 The table below summarizes house price changes in Arkansas metro areas over the past 5 years. Of the eight metro areas that include parts of Arkansas, only Hot Springs and Pine Bluff have shown recent declines. Over the past two years, metro area which has exhibited the largest house price increases is Fayetteville, where house prices declined the most during the nationwide house-price decline. A similar situation holds in Memphis, where the declines during 2007-2011 were larger than in other parts of Arkansas, but a significant rebound in prices has taken place in the past two years. Texarkana is an unusual case: Recent house price increases in Texarkana have been larger than in several of the other metro areas in the state, but there was never any significant house price declines recorded in Texarkana during the housing bust. So over the past 5 years, house prices in Texarkana have increases more than any other metro area in the state. 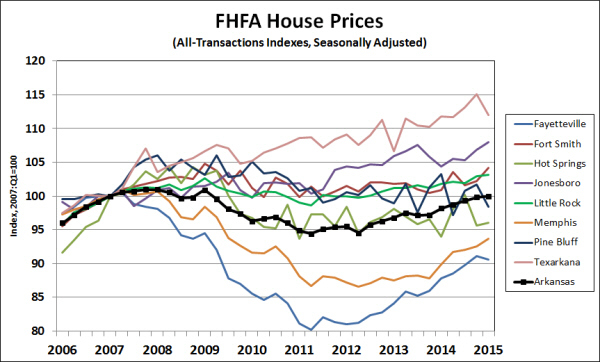 The latest update on house prices from the Federal Housing Finance Agency came out this morning. 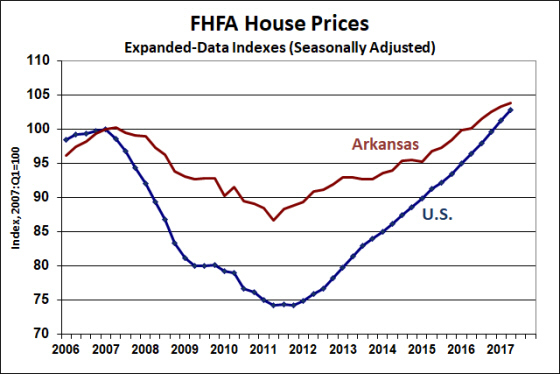 The most comprehensive of the FHFA indexes, the “Expanded-Data Indexes” show Arkansas house prices up 1.3% in the third quarter, compared to a 1.5% increase nationwide (seasonally adjusted). Over the past four quarters, Arkansas house prices were up 3.4%, while U.S. prices rose by 6.0%. Readings on house prices in Arkansas metro areas were mixed. From the second quarter to the third quarter, prices in Fayetteville, Hot Springs and Pine Bluff all increased sharply. However, prices were down in the state’s other metro areas. Over the past year, Fayetteville, Hot Springs and Memphis have shown the largest cumulative gains. 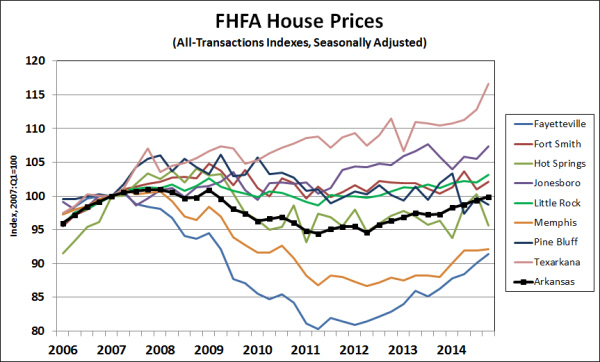 Source: Federal Housing Finance Agency; seasonally adjusted by the Institute for Economic Advancement. The figure below displays a slightly longer-run view. Relative to the nationwide house-price peak at the beginning of 2007, prices are higher or unchanged in most of the state’s metro areas. The chart shows that the three metro areas that have shown the most rapid appreciation over the past year or two are the same areas that exhibited the largest declines during and after the recession. For example, prices in Northwest Arkansas declined by nearly 20% from the beginning of 2007 until mid-2011, but have since recovered to the point of being only 9% below the 2007 peak. New data from the Federal Housing Finance Agency indicate that house prices in Arkansas increased modestly in the second quarter. 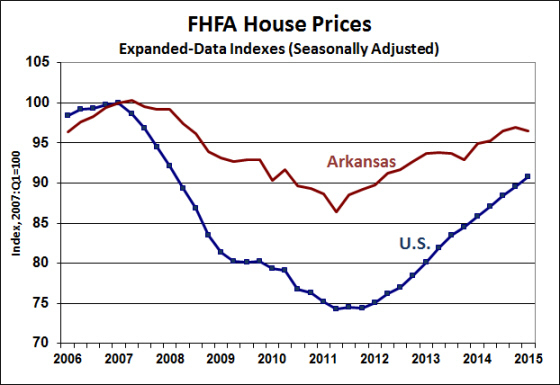 According to the FHFA “Expanded-Data Indexes,” prices of Arkansas homes increased 0.2% from the previous quarter, and were up 1.6% from a year ago. Prices in Arkansas have been increasing at a significantly slower pace than the nationwide average. For the U.S., house prices rose 1.3% in the second quarter, and were 6.2% above the levels of 2013:Q2. Generally speaking, the areas of the country that experienced the largest house-price declines from 2007 through 2011 are the areas where we are seeing the largest price increases today. On average, house prices did not decline dramatically during the market decline, and so recent price increases have been more muted. The expanded data indexes are not available for metro areas, but the FHFA does publish “All-Transactions Indexes,” which included data from home sales and refinancing appraisals (but without additional information from county property recorders’ offices). As shown in the table below, prices have been increasing more slowly than the national average in all of Arkansas’ metro areas. Compared to a 5.7% year-over-year increase for the U.S., prices have increased only 1.6% statewide. The largest increases were in Memphis (3.7%) and Fayetteville (2.7%), each of which experienced above-average price declines during the 2007-11 period. House prices have declined over the past year in Pine Bluff and Texarkana, and have risen only slightly in Hot Springs and Jonesboro. Additional data on metro-area house prices is available from CoreLogic®, a data and analytics company. 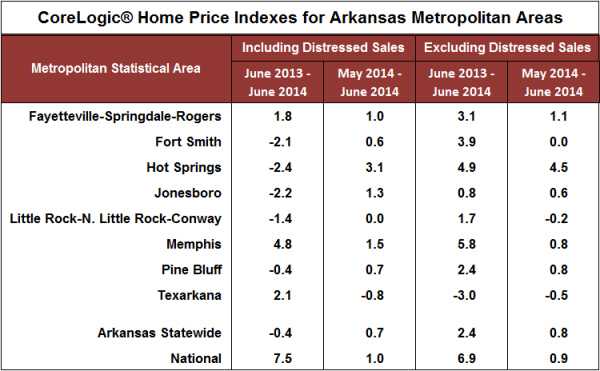 In the past 12 months (through June), the CoreLogic house price data confirms home-price weakness in Arkansas. The statistics from CoreLogic also present the influence of distressed sales (foreclosures and short sales) on home prices. The FHFA data are based on conforming loans, so do not included distressed sales. In general, the inclusion of distressed sales continues to put downward pressure on home prices. An exception is Texarkana, where price declines have been more pronounced in the sample that excludes distressed sales. One possible interpretation of this pattern is that distressed sales where having an even larger depressing effect on market prices a year ago than they do now. New data from the Federal Housing Finance Agency shows Arkansas house prices rising, albeit at a slower trend than the rest of the nation. 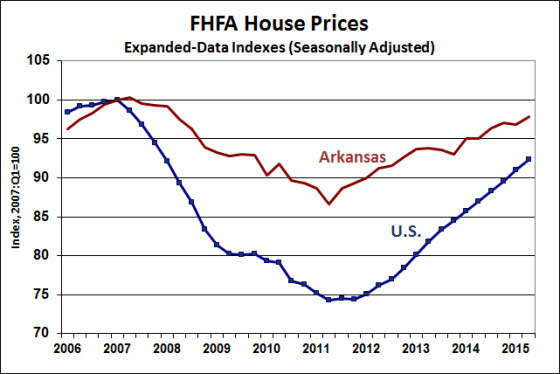 The most comprehensive of the FHFA’s house price indexes — the Expanded-Data Index — shows that Arkansas house prices rose 1.6% in the first quarter of 2014, slightly higher than the 1.4% pace for the U.S. Over the past four quarters, however, Arkansas prices have risen a total of only 0.9%, compared to a nationwide rate of 7.0%. 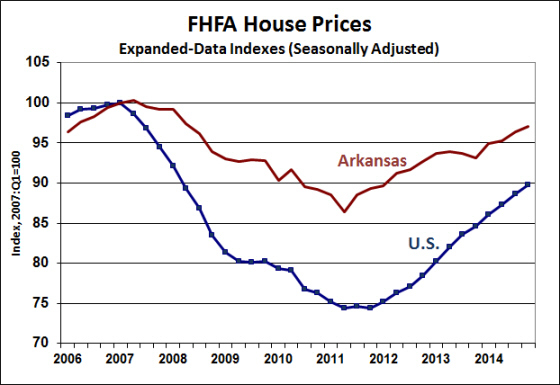 Since the trough in house prices in 2011:Q2, prices in Arkansas have risen by 10%, while the average U.S. increase was 15.5%. The slower rate of appreciation in Arkansas house prices mirrors a slower rate of depreciation during the house-price collapse of 2007-11. From 2007:Q1 through 2011:Q2, house prices in Arkansas declined 14%, while average prices for the U.S. declined by over 25%. In markets where price declines are the largest, the rate of recent appreciation has been the most rapid. For example, prices in Arizona declined by 46% from 2007 to 2011, and have recovered by 31% since. The same general pattern is true for metropolitan areas within Arkansas. The Fayetteville-Springdale-Rogers metropolitan area suffered the largest price declines in the state, dropping by nearly 20% during the period of depreciation (FHFA All-Transactions index). Since 2011:Q2 prices in Northwest Arkansas are up 8.1%. Meanwhile, prices in the Little Rock metro area are up only 3.3% from trough, after a net decline of only 1.2% during the nationwide house price decline. House prices in Arkansas’ other metro areas have generally changed little over the past several years. Prices in Pine Bluff, Fort Smith, Jonesboro and Hot Springs continued to appreciate after the nationwide peak in early 2007, but only Texarkana and Jonesboro have seen positive appreciation over the most recent 5-year period. More recently, prices have been weakening in Jonesboro (down 2.2% over the past year) and in Hot Springs (down 3.5%). 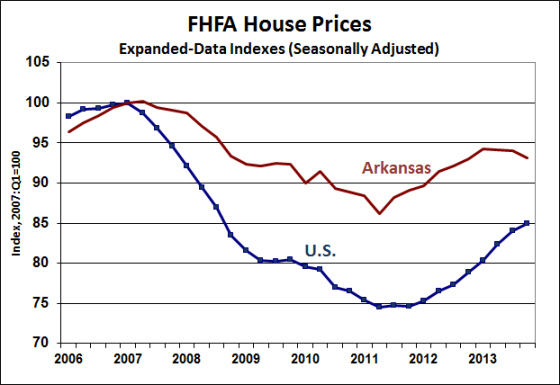 Data from the Federal Housing Finance Agency shows that home prices in Arkansas rose modestly during 2013. 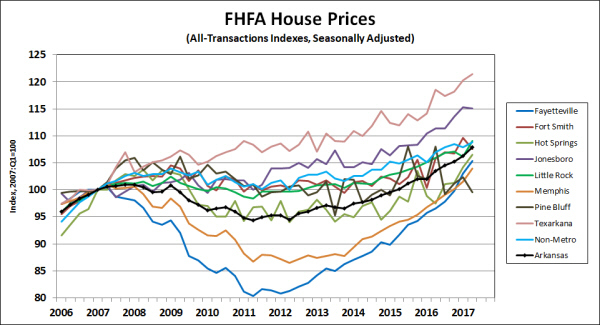 From the fourth quarter of 2012 through the fourth quarter of 2013, the FHFA Expanded Data Index shows an appreciation rate of 0.2% (seasonally adjusted). The comparable rate of appreciation for the entire nation was 7.8%. All of the gain in Arkansas home prices was attributable to an increase in the first quarter of the year (+1.3%). Prices declined 0.9% percent in the fourth quarter, following modest declines in the second and third quarters. The relatively slow rate of appreciation in Arkansas is not surprising. During the house price collapse of 2007-2011, prices in Arkansas did not fall nearly as far or as fast as the national average — hence, we are experiencing a smaller bounce-back. The state-wide average performance of house prices gives a general view of residential real estate prices in Arkansas, but it also masks some differences across regions. As shown in the table and chart below, house price performance has varied considerably among the state’s metropolitan areas. The Fayetteville metro area saw the largest increase in house prices over the year (and over the most recent 2-year period) as its market recovered from the steepest price decline in the state during the 2007-11 decline. House prices in Texarkana were down slightly for the year, but that change represents only a modest setback in an otherwise increasing trend. Fort Smith and Hot Springs saw the largest 1-year declines, and prices in both of those metro areas are down over the most recent 5-year span. Nevertheless their cumulative declines since the beginning of 2007 are smaller than either Fayetteville or Memphis. (In fact, from 2007:Q1 through 2013:Q4, house prices in Fort Smith are down only 0.1%.) House prices in Memphis declined by over 12% during the 2007-11 downturn, and have yet to show any significant improvement. Recently released statistics on home prices from CoreLogic®, a data and analytics company, corroborate some of the trends seen in the FHFA data. For example, the CoreLogic figures show a much slower rate of appreciation in Arkansas than for the national average. 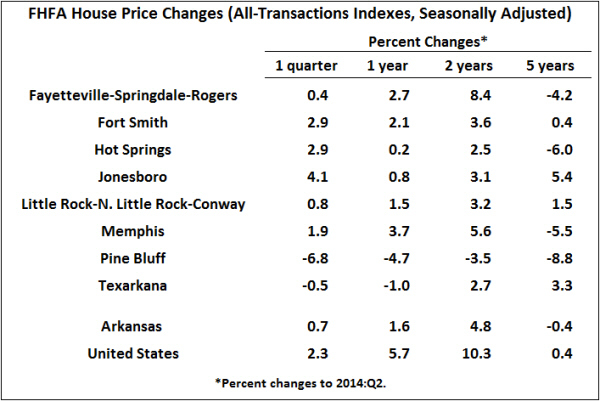 In fact, the full-sample CoreLogic numbers show a decline in Arkansas home prices during 2013. After netting out distressed sales*, however, home prices were up 3.2% from December 2012 through December 2013. The CoreLogic statistics also show relative weakness in Fort Smith and Hot Springs — as do the FHFA data. Net of distressed sales, however, prices in Fort Smith were rising faster than the statewide average. Increasing prices in Texarkana confirm that the short-term weakness suggested by the FHFA data is likely a data anomaly, and not a sign of a trend reversal. * Distressed sales include properties that have been through foreclosure and those that are exchanged in “short-sales” (in lieu of foreclosure).